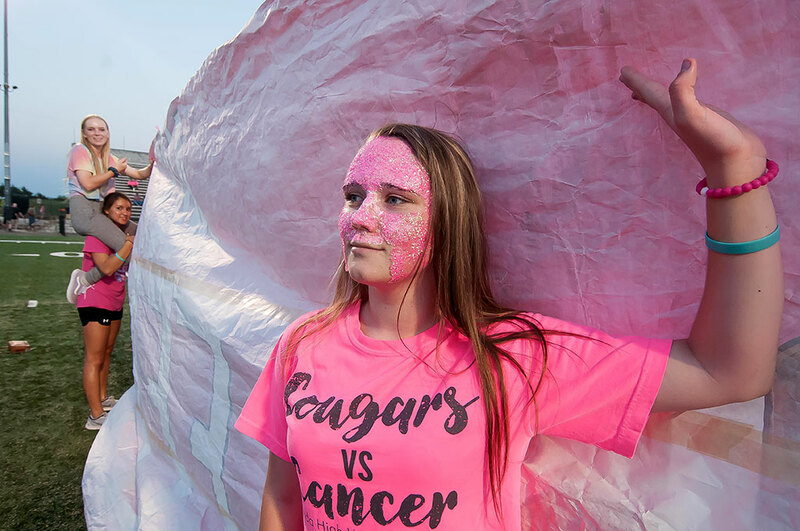 Amelia Holtzman wears pink sparkle makeup for “Pink Out Night” duriing pregame activities at the Ada football matchup against Bethany Friday night. At first she wanted to pose for me, but I asked her to watch the happenings. I thought it expressed Pink Out Night very nicely. Some years ago I wrote “HD Garbage” in which I talked about the commercialism of imaging and filmmaking, particularly the urge to buy more products to replace perfectly good products because their tech, especially their resolution (and by extension their perceived quality), is regarded as outdated. It’s part of a bigger aspect of mercantilism that insists we make foolish financial decisions in order to “upgrade” whether it’s really an upgrade or not. This is an Ada High Color Guard member I photographed in 1989 whose name I think is Cheri Platt. I had a huge crush on her, since I was single and 26 at the time. Ask yourself: is this memory diminished or ruined in any way by being a “low resolution” film image? In the biggest picture, we see commercialism selling us the idea that we need more, better technology to improve our entertainment, while at the same time we are a less-happy, less-healthy people, and most entertainment is not only unworthy of high definition, it is unworthy of being viewed. Another 72-inch super-high-definition television will never be able to make that scriptless $350,000,000 super-hero movie into a life-changing moment. A friend of mine is a huge brand-name fanboy. He is constantly pining for the next big thing, with still-frame and video resolution being at the top of his list. Yet I’ve never seen a single second of HD or 4K video from him. Not one. Last night at the game I saw what I see a lot: photographers with very expensive “full frame” (36mm x 24mm image sensor) cameras with the same lens I am using, a 70-200mm f/2.8 zoom. As much as the photography world touts this sensor size as the answer, I find it ironic and annoying that these photographers are always 30 yards farther from the play than I am. I know what they are getting: tiny figures in the center of the frame with lots of grass below and sky above, and I sometimes confirm it by sneaking a peak at the backs of their camera. As far as I am concerned, smaller sensors, in my case 24mm x 15mm, are a solution, not a problem. My stuff looks great. 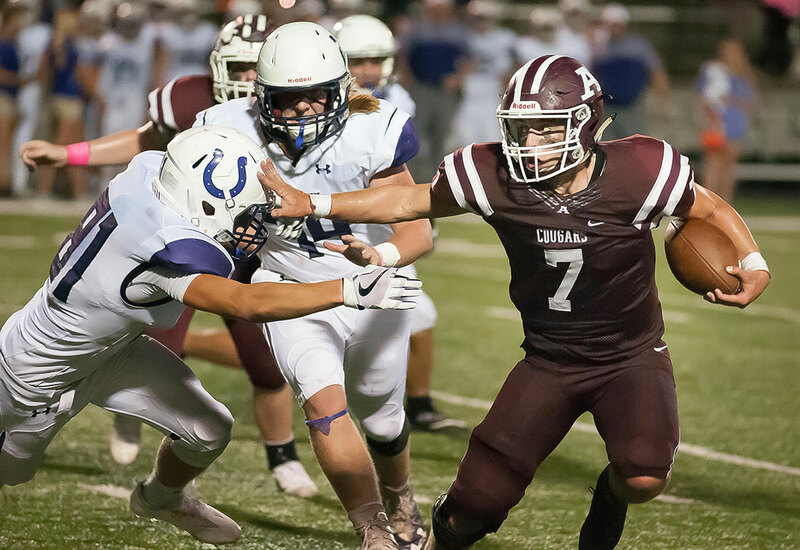 Justin McFarlane stiff-arms an opponent in last night’s game against Bethany. I was about eight yards ahead of the play, which came toward me. At 200mm with my 24mm x 15mm image sensor, the frame filled up nicely. The “full frame” crowd was 30 yards down field, missing this image. The kids I cover in our community, on the other hand, are the children of the kids I covered 25 years ago, and everyone on the sidelines or in the stands has a dog in the fight. This video is a memory and a moment. Nothing about it is improved or destroyed by its resolution. The next time you consider if your video would be improved by a new phone or camera, take out your existing phone or camera and shoot with it. Take a film class. Watch how films are made. Learn how to storyboard and write a script. Only when you have accomplished this, and are making films, will you go beyond the fallacy of yearning to buy more. 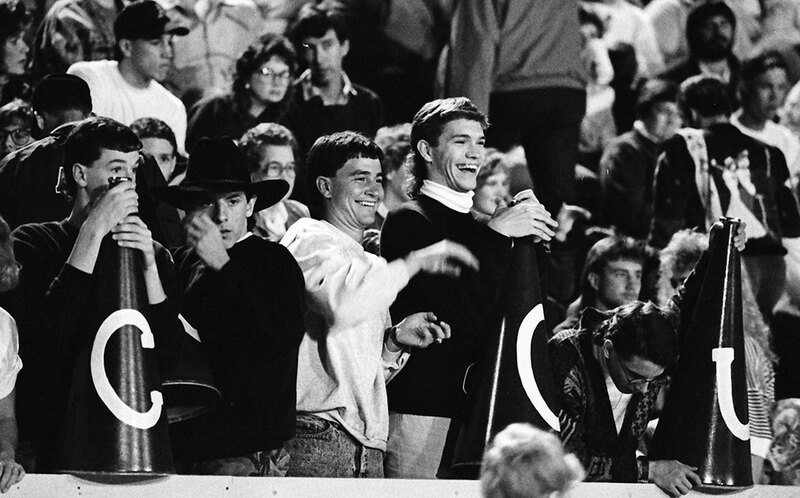 Ada fans gather together in September 1989 in the exact same spot at Norris Field on the ECU campus as they did last night. No one enjoys moments or memories based on their technology. Well said. And it reminds me I need to shoot more. I really enjoy posting a good picture that results in a barrage of “what settings did you use” or “what lens did you use” or similar questions. Sometimes I just want to randomly post settings like, ISO 8000, shutter 1/4000th, aperture should always be f/32 in order to get the full lens clarity.